After more than a decade-long journey, the biggest indirect tax reform since Independence -- GST -- is finally set for a midnight launch on Friday in Parliament's Central Hall in the presence of President Pranab Mukherjee, Prime Minister Narendra Modi, Vice President Hamid Ansari, Members of Parliament, state finance ministers and chief ministers. The Goods and Services Tax (GST) will be launched on midnight today in an hour-long event that will evoke memories of the "Tryst with Destiny" moment of 1947. On the midnight of August 14-15, 1947, the country ushered in Independence from British rule with a special function in the Central Hall in which the first Prime Minister, Jawaharlal Nehru, made his now famous speech "Tryst with Destiny". Acknowledging the role of previous governments in readying the GST, the government has also invited former Prime Ministers Manmohan Singh and H.D. Deve Gowda, though the Congress still appears undecided over attending the special midnight function in Parliament. The Trinamool Congress has already decided not to attend the June 30 midnight programme as a mark of protest against the "unnecessary disastrous hurry" to roll out the pan-India tax regime. Major opposition parties are likely to skip the midnight launch of GST, sources in the parties said. The issue was discussed informally among leaders of the opposition grouping which gathered here for filing of nomination of their Presidential candidate Meira Kumar on Wednesday. The leaders said there appeared to be a lot of confusion and apprehension among various sections of the trading and business community, some of whom are protesting against certain provisions of the new indirect taxation law. Opposition leaders said they would like to keep away from the function which they feel was being planned by the government as a publicity gimmick. "It's not a tryst with destiny but playing with the destiny of people," one leader remarked. GST, termed as the most radical tax reform since Independence, seeks to subsume all central indirect taxes like excise duty, countervailing duty and service tax, as also state levies like Value Added Tax, entry tax and luxury tax, to create a single, pan-India market. So far, apart from Jammu and Kashmir, all the states have passed the State GST (SGST) law. Finance Minister Arun Jaitley has written to J&K Chief Minister Mehbooba Mufti to join the GST regime by July 1. Going back in history, GST was first discussed in the Kelkar Task Force report on indirect taxes in 2003 and a proposal to introduce a national GST by April 1, 2010, was first mooted in the Budget Speech for the financial year 2006-07. 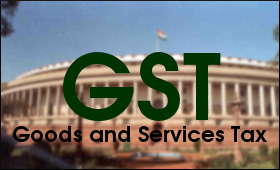 Decks were cleared for the GST regime with parliamentary approval to Central Goods and Services Tax (GST) Bill, Integrated GST Bill, Compensation GST Bill and Union Territory GST Bill 2017, on April 7.